Wins are awesome and should be celebrated. The #1 reason that we hear about why employees tend to stop giving feedback via TINYpuse is because they don't feel as though their administrators are taking action. So much happens in the background that it's easy to forget to stop and celebrate the wins that come out of TINYpulse! (i) You must have Admin or Super Admin permissions in Engage in order to enable this functionality. The Wall of Wins lets administrators publicize action being taken on employee feedback from TINYpulse and helps highlight positive change. It can be shared with employees by URL or put up on a TV in your office, but the best way is to publish it to LIVEpulse. 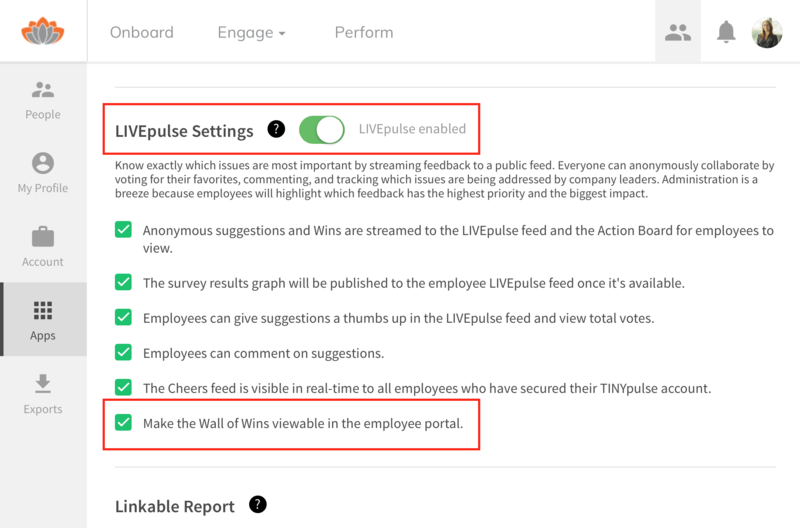 Publishing the Wall of Wins to LIVEpulse makes it instantly accessible to employees. They can check it out after they've responded to their pulse survey, or if they've just sent a Cheer to a teammate, or if they want to see one of their own suggestions that has been added as a Win! It's definitely the most convenient way to keep employees in the loop. Enable all LIVEpulse features using the main LIVEpulse Settings Individual features controlled by this switch are listed directly below for your reference. Enable only the Wall of Wins by selecting the final checkbox Make the Wall of Wins viewable in the employee portal. Once enabled, employees will see a new Wall of Wins icon in the left navigation the next time they visit TINYpulse. Looking for even more ways to highlight wins? Check out this article to learn more about streaming wins to the LIVEpulse feed.